Broken Rail and Rail Heaters – Spectrum, Inc.
A broken rail can ultimately lead to a train derailment if it goes undetected, which can result in major loss of life. This issue has come into focus due to the increase in shipments of ethanol, hazardous chemicals and crude oil. Derailments in cars that transport these shipments are especially devastating due to the increased potential in loss of life, property damage and environmental impact. There are several means of detecting a broken rail. A visual examination is a common practice amongst railroad track owners. A railroad employee walks alongside the rail and visually examines it for irregularities. In addition to visually examining the rail, the employee may use a test device that outputs data in real time. A crack forming at a bolt hole, a depression on the top of the rail, or a completely fractured rail may be found using this method. While this is a good way of detecting surface flaws and rail that is already compromised, it will not detect flaws beneath the surface. An electrical continuity test (aka “broken rail detector system”) puts low voltage through the rail to create a circuit. On one side is a power source, and on the other a relay. If there is a fracture anywhere within the monitored area, the relay should trip. This method can detect complete fractures but cannot detect any flaws that leave an electrical path around it. If the fracture occurs on top of a plate or behind a fishplate, the electrical continuity may still be maintained and the fracture will go undetected. One concern on the railroad is how rail heaters used to deice a turnout will affect broken rail detectors. 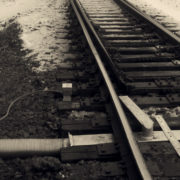 The only two methods of detecting defects in the rail that could be affected by a rail heater would be the electrical continuity and induction methods. The problem arises from the fact that the rail heaters have a conductive metal sheath, and the electricity will pass through it as well as the rail. In the case of the electrical conductivity test, if there is a broken rail, the circuit could be completed by the rail heater. Broken rails are more likely to happen at a turnout or a road crossing, according to BNSF broken rail data, when compared to open track. This is due to a larger dynamic load and less maintenance on the track. In some instances, the amount of ballast that must be removed for the switch and its parts allows the switch to move vertically (aka pumping) resulting in even more stress being applied to the rail. Most rail employees who work in track maintenance and inspection understand that the rail heater may render their detection system inadequate and take that into account when they schedule and perform maintenance. Where applicable, different methods of detection come highly recommended where broken rail is frequent and rail heaters are essential to the operation of the switch points. Most rail heaters do not cross a rail weld due to the length of the stock rails compared to the longest rail heater (80’ vs 34’ respectively). With the stock rail length potentially increasing in the near future, the risk of a rail heater crossing a rail weld becomes even less likely. While this helps reduce the chance of a failure, broken welds historically result in fewer derailments than detail fractures. 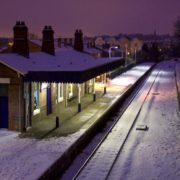 Research shows that broken rails happen more often in the colder winter months than any other time of the year. This is said to be due to many reasons, including increased tensile stresses in the rail, a track bed that intensifies and increases wheel impacts, and increased rates of shelling and thermal damage.